You are born with breadfruit, you grow up with breadfruit and you die with breadfruit. This popular saying from the Micronesian island of Chuuk, thousands of miles off the coast of Hawaii, captures the importance of this starchy fruit. It’s a staple both for the Chuukese living in Micronesia, and for people like Micaela, who were forced to migrate to Hawaii due to a changing climate and rising seas. Though Micaela moved to Hawaii seeking a better life, she instead found a community of Chuukese struggling with hunger. 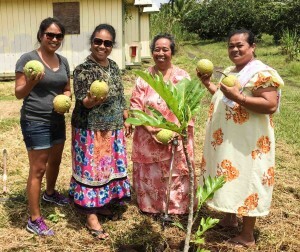 Through the One ‘Ohana: Food and Housing for All program, Micaela organizes groups of women to learn farming techniques. Together, they gain the knowledge to plant breadfruit trees and feed their communities. For Micaela, the project is a way to look to the future while remembering the past. “It’s been many years since I dug my hands in the ground. We are reconnecting back to our home, even though it’s not the soil from where we came from,” she says. Learn more about the One ‘Ohana: Food and Housing for All program. 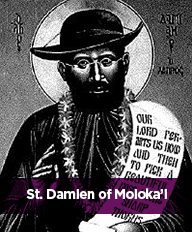 St. Damien of Moloka’i is most widely known as the “leper priest,” who volunteered his life to serving the most rejected and neglected of society. During the mid-to-late 1800s, St. Damien became the official pastor for those exiled to the leper colony of Kalaupapa on the remote island of Moloka’i. He brought joy and dignity to those who had no hope. He built homes, churches, schools and orphanages at the poverty-stricken settlement and offered rudimentary healthcare to people even the doctors were afraid to touch. After 15 years of dedicated service, Father Damien contracted the disease himself and died at the age of 49. He continues to be a model of inspiration around the world and is remembered through the legacy of his order, the Congregation of the Sacred Hearts of Jesus and Mary. 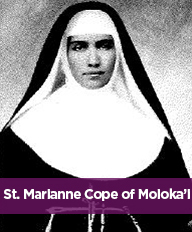 St. Marianne Cope of Moloka’i is the founder of the Franciscan mission in Hawaii and fondly remembered as the Beloved Mother of Outcasts. She sacrificed 35 years of her life by serving the most needy and vulnerable of Hawaii. During the late 1800s, she courageously answered the call to leave her home in New York and travel to a foreign kingdom where thousands were dying from the epidemic of leprosy, now known as Hansen’s disease. St. Marianne followed in the footsteps of St. Damien by offering care, love and dignity to those who were exiled in the remote colony of Kalaupapa. Her legacy continues today in the lives and ministries of the Sisters of Saint Francis in education, healthcare and spiritual growth.